I would do anything, within my core values, for these women! They are real friends. Friends you can call up early in the morning and wake them up and they won’t get mad! They’ll listen to your problem. Friends who will bring you groceries if there’s too much month at the end of your money, back when times were harder. Friends you would do the same things for and more, any time, any place. Friends who would be there one of our perfect marriages ever blew up in our face. Friends you would stand up for if anyone tried to put them down in any way! Friends who stand by you at the loss of a parent — or heaven forbid a child, or have a heartbreaking problem with one. We are true, loyal, on each other’s sides, real friends. And we are so thankful to have each other! These are the friends that were at my birthday lunch and we had a blessed time. We had an inspired, wonderful, life-affirming time. We gave each other the best present a friend can give one another: the Gift of Love! 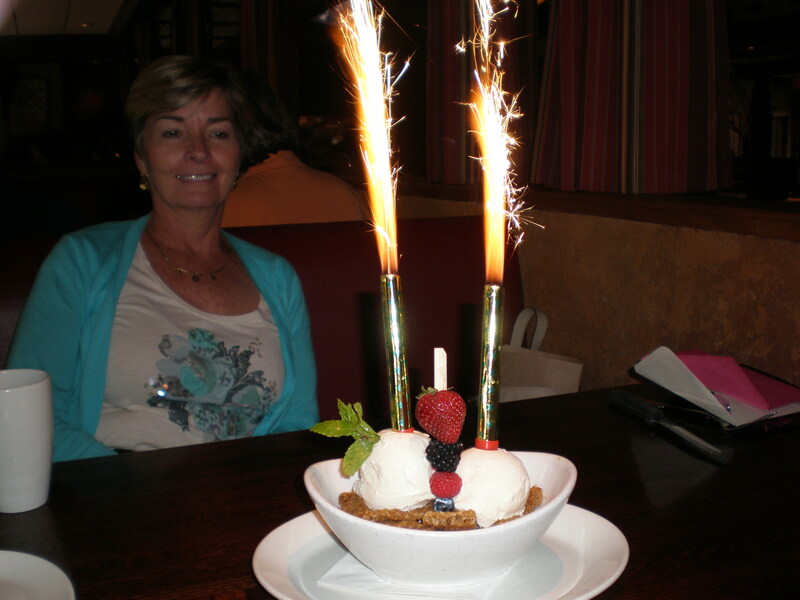 Here’s the celebratory dessert we shared! This entry was posted in Friends, quote by Libby Baker Sweiger. Bookmark the permalink.